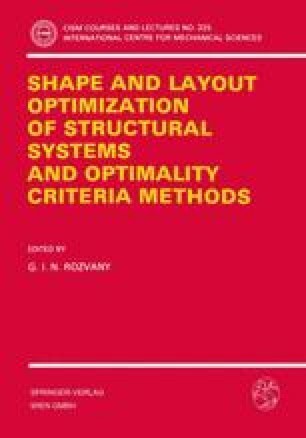 In the previous chapter, we discussed optimality criteria methods for optimal plastic design and presented a simple example based on a closed form analytical solution. In optimal elastic design, however, which is to be discussed in this chapter, it is usually necessary to resort to numerical methods because the equations involved are too complicated for an analytical treatment. Moreover, whilst in optimal plastic design (Fig. 6) we had a half real system (involving loads p, stresses Q and statical admissibility) and a half adjoint system (involving adjoint strains , adjoint displacements ū and kinematic admissibility), in optimal elastic design we have a full real and a full adjoint system.